A Hindi remake of Phone Booth (oh not a credited remake, just to clarify) is not exactly the type of movie you would expect to have a soundtrack. 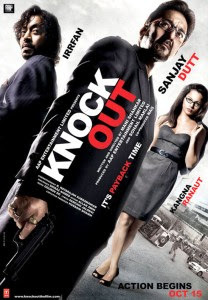 But director Mani Shankar quite obviously didn’t think so, and hence it is that I am doing the review of Knock Out. And the depressingly haunting Khushnuma totally supports the director’s decision, working beautifully in both its versions. Gourov Dasgupta gets it totally right with the vocalists, Rahat Fateh Ali in v1 and Krishna in v2. The title song, in spite of the middling tune and rock orchestration, is worth listening owing to Vishal Dadlani’s energetic rendition. Jab Jab Dil Mile pretty much follows Knock Out’s footsteps in that the arrangement is staid and only survives owing to the lead vocalist, in this case, Sunidhi Chauhan. A pretty mediocre item number. Same goes for the remix. But Tu Hi Mere Hum Nawa significantly improves things, KK delivering a very pleasing melody to perfection. The dholak beats that underline the entire song give it a very SEL touch due to their being so associated with SEL tunes of late. Things come to a close with an interestingly packaged folk-based item number called Gangubai Pe Aai Jawani, brilliantly rendered by Sumitra. After a mixed bag of performances in a series of multi-composer flicks which culminated in the abominable HELP, Gourov Dasgupta finally looks to be finding his footing in Bollywood via this debut solo venture of his. Now what needs to be seen is how Mani Shankar has (if he has at all), done justice to Gourov’s efforts in a movie of this kind.